SHUNYO MAHOM is a Zen artist, author, and songwriter trained in the Western science of creative change (NLP) and the Eastern science of subtle-body healing and meditation (Osho Academy). 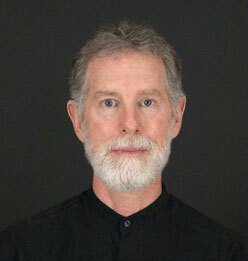 He works in the Southern California area as a Conscious Life Consultant, facilitating creative change and healing. "Zen Pearls", an art book by Osho and Shunyo Mahom. From Madhuri Z K Ewing's review: "The paintings – most calligraphy-inspired, some more graphic and colorful, reminding me a bit of Padma's "Zen Tarot" - are grace and immediacy and color and boldness and wow!" "Deva Leela", a delightful insighful poetic autobiography. "Mama Llama's Pajamas", a children's book, illustrated by Carene Villegas. Shunyo's "Zen Pearls" Art is an intuitive expression of the heart. Each image reflects the spontaneity and spaciousness of Zen as well as Shunyo’s natural sense of grace and beauty. Before painting, Shunyo relaxes into meditation then creates a Zen Pearls painting with a few spontaneous strokes of ink. To complement the spirit of the initial calligraphy strokes, he may add a faux-pearl medium, acrylics, or watercolors. When commissioned by an individual, couple or group, Shunyo creates a Zen Pearls Portrait which reflects the essence of the client. Each personalized portrait begins with a personal or online interview. Then, in meditation, Shunyo paints a portrait which can be mounted on a silk scroll in China, providing elegant inspiration for years to come. Shunyo has been a disciple of Osho since 1981 and shares the Osho Heart of Creativity program free online: 3 therapeutic meditations which support individuals to creatively celebrate life with love and awareness.